Power capacity of the 11-story data center Facebook is preparing to build in Singapore will equal total capacity of all data centers other hyperscale cloud platforms have built for themselves in the tiny island nation, according to an expert on the local market. The social network said this week that the first data center built to its own design in Asia will eventually reach 150MW of power capacity. By the estimate of Jabez Tan, research director at Structure Research, the portion of that capacity that will actually power servers and other IT gear will be closer to 120MW, which is roughly the same as the aggregate amount of capacity in Amazon Web Services, Microsoft Azure, and Google Cloud data centers in Singapore. Tan’s total capacity estimate is limited to data centers these companies have built on their own, excluding all the capacity they lease from specialist operators like Singtel, Keppel Data Centers, Digital Realty Trust, or Global Switch, among others. Like they do in many other markets, the hyperscale platforms use a mix of owned and leased data centers in Singapore, but they’ve been demonstrably less reluctant to build their own on the island, Tan said in an interview with Data Center Knowledge. In other words, a company like Google or Facebook can be sure that there will be enough demand in the region for its services to grant a substantial capital investment in physical infrastructure, and that there isn’t a better location around for serving that demand. Tan is an expert on Asian data center markets and has authored numerous research reports focused on the Singapore market specifically. Contrary to what many news reports covering Facebook’s announcement have said, the Singapore facility will not be its first data center in Asia, nor its first in Singapore. As we have reported earlier, the social network has been leasing multiple megawatts of data center capacity in Singapore from San Francisco-based Digital Realty Trust for several years now. In a 150MW data center with PUE of 1.19, the amount of power consumed by IT gear is about 126MW. Tan’s estimate is even more conservative, “since almost all the [data centers] I’ve come across never hit their design PUE when fully built,” he said. The building will have 1.8 million square feet of floor space and cost more than $1 billion, according to Facebook. 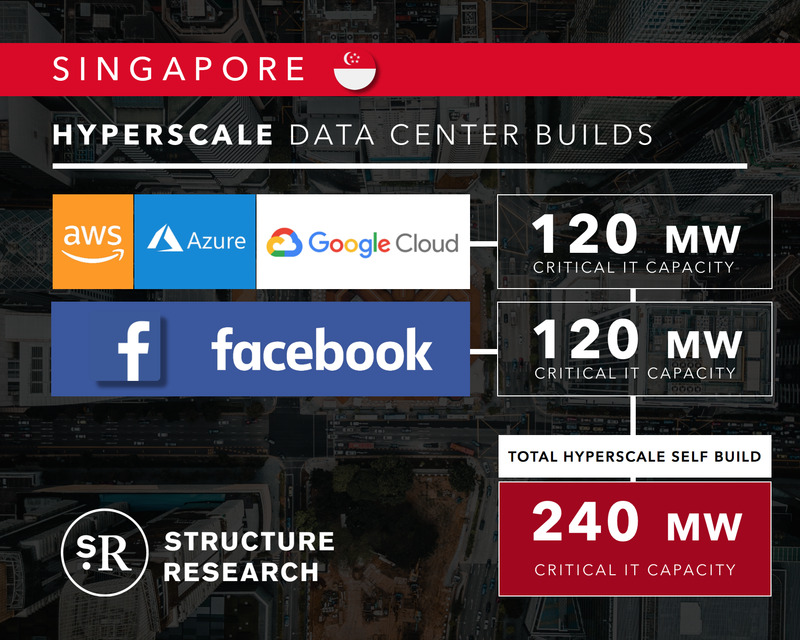 Given the pace with which hyperscale cloud platforms have been expanding their Singapore data center capacity, the scale of Facebook’s planned facility isn’t surprising. Google launched its first Singapore data center in 2015 and had a second one up and running two years later, Tan pointed out. A third one is due to come online in 2020. Microsoft now has two of its own data centers on the island. Singapore developer Mapletree Investments is building a massive Singapore data center for what market insiders believe will be a single occupant: AWS.